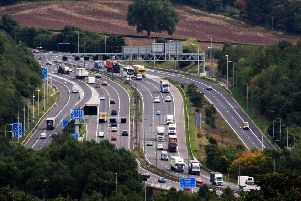 Highways England clears up after a collision on the M1 between J29 and J29A. Drivers were stuck in traffic chaos after a collision between a caravan and two cars on the M1 today (April 25). Highways England partially closed off the northbound carriageway between J29 for Mansfield and Chesterfield and J29A for Markham Vale and Bolsover around 10.30am. The collision, between a caravan, a Suzuki Swift and Ford Focus, caused a 20 litre oil spillage on the carriageway. A police spokesman said there were no serious injuries. Contractors have now cleaned-up and fully re-opened the carriageway. The traffic is beginning to ease.